We offer extensive experience in providing marine engineering services to oil & gas companies and marine vessels operators. Our resources are available to assist marine repairs or support offshore marine operation. We are able to offer marine operators a complete spectrum of value-added marine services ranging from the engineering support through to vessel operation. 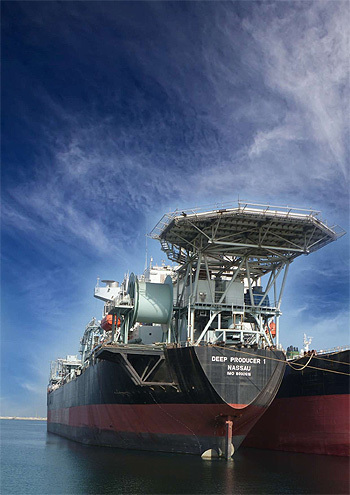 On 7 July 2011, TH Heavy Engineering Berhad announced the acquisition of its first Floating Production Storage & Offloading System (FPSO), an offshore floater solution comprising a vessel equipped with high-capacity crude oil production facility. For TH Heavy, this major decision is solidly backed by the anticipation of a robust upstream scenario worldwide where global capital expenditure on deepwater projects is expected to be around USD167 billion between 2010 and 20141 . By becoming the owner of FPSO DeepProducer 1, TH Heavy will immediately infuse diversification from its core expertise by providing practical floating production solutions for marginal fields, early production systems (EPS) and extended well test (EWT). In Malaysia particularly, the offshore exploration activities are shifting into deeper waters after the success of the 1st deepwater E&P venture with Murphy Oil in Aug 2007 at the Kikeh field, 110km offshore Sabah with water depth of 4,400ft. Furthermore, PETRONAS’s recent move into the development of marginal fields through the introduction of risk service contracts (RSC) for the Berantai and Sepat fields for example, have resulted in more demands for floating production solution providers to participate in this growing upstream segment. TH Heavy’s bold move into the floater market will greatly complement its existing capabilities as a major offshore structures fabricator and provider of other related O&G services like manufacturing and servicing of cranes, hook up, commissioning and installation, marine and engineering services, to secure more opportunities within the expansive O&G chain of activities. TH Heavy’s acquisition of FPSO Deep Producer 1 will be its first step to explore into greater waters.